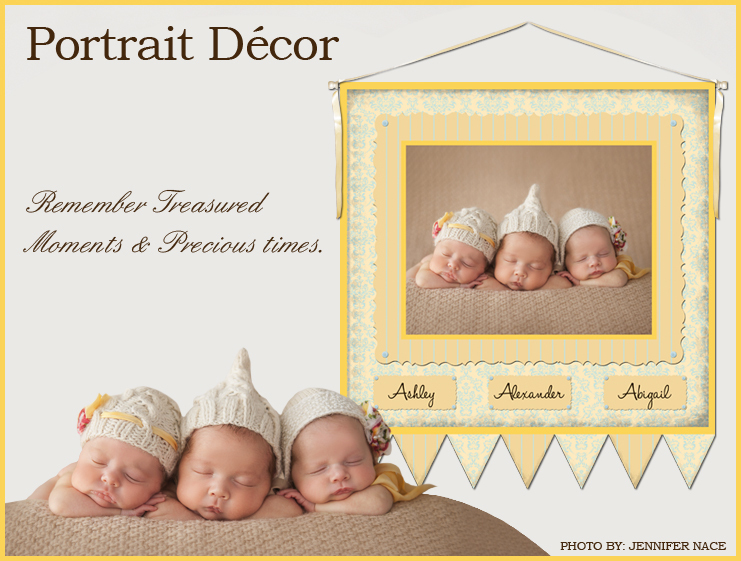 Remember treasured moments and precious times with our custom canvas portrait décor. Each unique design incorporates our award-winning children's wall art with personal digital photos for irresistible one-of-a-kind keepsakes sure to be cherished for years to come! Using the giclée method of fine art printing, each piece of portrait décor is reproduced on museum-archival-quality canvas in a variety of different formats and sizes, including our popular gallery wrapped canvas and canvas wall hangings. To preserve the integrity of the portrait décor for years to come, the surface of every canvas is glazed with a UV protective finish. Simply select a design and submit a 4in.x6in. or larger photo in jpeg format (1MB or larger, please) and at least 300 dpi. Photos received will be cropped to fit the proportions needed for the final image, unless otherwise specified. Photos may be placed into the art composition "as is" or digitally enhanced and/or edited through a program called Photoshop to suit your individual style. Custom-made and hand-crafted in the USA, our portrait décor may be ordered with personalization or customer's choice of text. Many designs may be hand-embellished with materials such as Swarovski crystals and iridescent opal fairy dust glitter. For the customer who wants a specific decorative look, custom color matching the art image to bedding and/or paint is always an option. See individual product descriptions for details per design. Finished products ship within 2 to 3 weeks from receipt of order, following a proof approval from the customer (email only). For faster service, email your original photos to dishandspoon@comcast.net. Or mail your photos to Dish and Spoon Productions • Graphics • 7300 Beaumont Court • Pleasanton, CA 94566. We cannot reproduce copyrighted photographs and reserve the right to reject any photo.